Q. How do I access The New York Times Online? The online version of The New York Times. The San Jose Public Library provides free online access to the New York Times on Internet computers and library wi-fi at the Dr. Martin Luther King, Jr. Library and at all Branch libraries. We also offer 72-hour offsite access through our website. Go to your favorite browser and type in www.nytimes.com. You can also find it by going to the San Jose Public Library website. Click on eLearning in the menu at the top of the page. Choose "Magazines & Newspapers" from the "Choose a Subject Category" drop-down menu. Find "New York TImes Online" in the alphabetical list and click on the link. Click on this link to get your New York TImes access code. This code will be usable by you for 72 hours. After the first 72 hours have passed, you will need to redeem another code for another 72 hours of remote access (i.e. Repeat Steps 1&2). Create an account with the New York Times or sign in with an existing New York Times account. Please be advised that registering an email address with New York Times will opt you into receiving email marketing communications from the New York Times. To opt out of receiving mailings, be sure to click on the check box during your initial sign up. Click on "Go to NYTimes.com". Please note the date when your access ends. Enjoy the New York Times for 72 hours! Follow steps 1 and 2 above to get your 72 hour access. Log in with the email you used to register -- the access code will have already been applied. 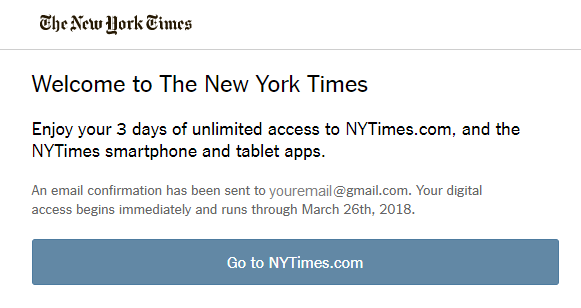 Enjoy your 3 days of unlimited access to NYTimes.com, and the NYTimes smartphone and tablet apps. An email confirmation has been sent to [your email]. Your digital access begins immediately and runs through [date]. Go to NYTimes.com [link].